A Quakertown woman was arrested Thursday for allegedly attempting to steal a kangaroo from a petting zoo, claiming she owned the animal. Loren J. McCutcheon, 52, has been charged with misdemeanor charges of theft by unlawful taking and trespassing, and a summary offense of damaging property. When police arrived, McCutcheon allegedly was found attempting to load the kangaroo into her Honda Pilot. McCutcheon claims she owns the animal, and was going to drive it to Florida because a court order didn’t allow her to keep it in Pennsylvania, according to the Bucks County Courier-Times. The petting zoo in question is Peaceable Kingdom, the same traveling petting zoo which houses 2018's only good character, Snow Camel. The petting zoo says the kangaroo belongs to the zoo's operator, Charis Matey. 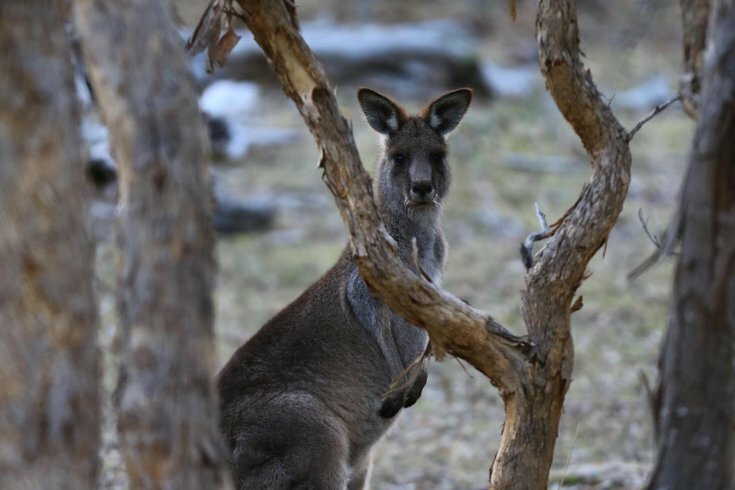 Matey and Peaceable Kingdom have been renting property in Bedminster, Bucks County, from McCutcheon since September, but the zoo asserts the kangaroo — reportedly named Jeffrey — belongs to Matey. Police say McCutcheon allegedly admitted using bolt cutters to access the petting zoo’s gated driveway. McCutcheon was released on $15,000 unsecured bail, the Courier-Times reports, and is set to appear at a preliminary hearing on Feb. 4.